A steady rain this evening. Showers continuing overnight. Low 42F. Winds N at 5 to 10 mph. Chance of rain 90%. 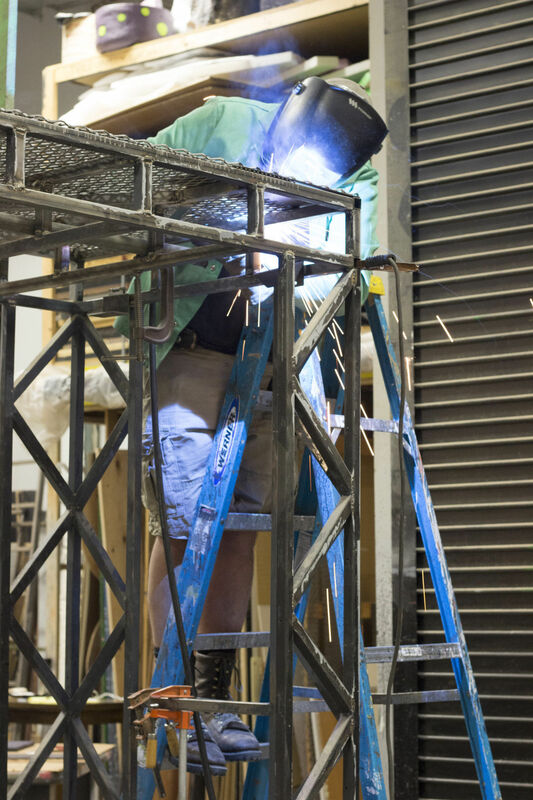 Rainfall around a quarter of an inch..
Scenic Carpenter, Karl Mitchell, modifying a steel scenery piece for “Urinetown: The Musical.” This unit was originally built for “Westside Story” and was recycled for “Camelot,” “Footloose,” “Willy Wonka,” “Tom Sawyer,” and “Last of the Dragons”. The Missoula Community Theatre’s selection of plays and the timing of when they are produced is based on several criteria, including the quality of material, the ability to meet the technical requirements and much more. Titles also are important; after all, MCT is a nonprofit organization that must look at the “sale-ability” of its shows. There’s "Les Misérables," "The Sound of Music," "Tarzan" and other well-known plays. But "Urinetown: The Musical"? Who came up with that title? And why? The answers are Greg Kotis, who wrote the book, and shares the music and lyrics credit with Mark Hollman. Come see it to find out. Since its debut in 2002, this hilarious satire about municipal politics, a water company and the legal system (How far from reality can you get?) garnered three Tony Awards, among other accolades. The irony is not lost on us that "Urinetown: The Musical" is our “zero waste” production this season. We think you’re in for a good time at this musical Pee-G parody. Performances are January 19-22 and 25-29, at the MCT Center for the Performing Arts. Tickets at mctinc.org, by phone at 406-728-7529 or at the MCT Box Office, M-F, 9 a.m.-5 p.m.